People make all sorts of weird stuff in Minecraft that I just don't get, but playing Left 4 Dead inside of Minecraft, that's something I can get into. 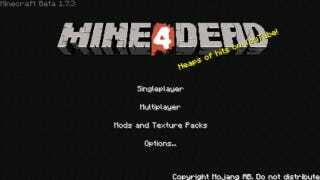 Mine 4 Dead: Blockhawk Down isn't just a Left 4 Dead level in Minecraft a full Left 4 Dead campaign complete with zombies, safehouses, 4-player coop and pills. Modder Bananafone31 brings even more terror to Minecraft with custom textures and sounds to skin the massive zombie-killing survival mod.